Sterling silver man's ring with lapis, turquoise and spiderweb turquoise inlay . 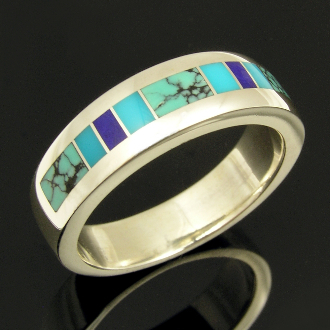 The end and center pieces of inlay are spiderweb turquoise. The dark blue stones are lapis lazuli and the lighter blue stones are turquoise. This ring can be customized in other stone colors and patterns by special order. The ring is 6mm wide and is pictured in a size 10. All other sizes are special order and will take 4 to 6 weeks to complete. The ring is hand signed "MMH" by Mark McBride Hileman. Many customers choose this style ring as an alternative wedding ring. A matching woman's wedding band is also available by special order.